Nearly everyone cares about the environment. But what exactly is "the environment"? That depends on how and where you live. If you are an American, you may occasionally ponder the media's claims that last year's hot summer was a precursor of catastrophic global warming, but in any case you probably perceive such environmental scenarios as somewhat esoteric and remote from your daily life. If you are a welder in a Chinese bicycle factory, in contrast, you are fully aware of the serious water and air pollution that China's rapid industrialization has brought to your region, but you probably accept the pollution with forbearance because the bicycle factory provides a steady job that enables you to support your family. Yet if you are a subsistence farmer in sub-Saharan Africa living on the brink of starvation, you probably think of the environment as nature's fickle preserve—the land and animals that in good years barely keep you and your family alive and in bad years bring starvation and disease. The environment of the rich and the environment of the poor are indeed a world apart. Life on the brink of starvation has in fact been the fate of the vast majority of humans throughout history. To people living in such poverty, the environment has always had only one meaning and purpose: it is the source of the food and shelter needed to survive and reproduce. Yet even at the start of the twenty-first century, the most affluent ever, the environment of the poor still does not provide sufficient food for them. Their hunger is not a transitory condition—it is chronic, debilitating, and deadly, blighting the lives of all who are affected. Approximately one billion people—one in every six people on earth—do not have enough to eat. Almost two-thirds of these chronically undernourished people (525 million) live in Asia and the Pacific. India alone has more undernourished (204 million) than all of sub-Saharan Africa, where 180 million go hungry. China is a close third, with 164 million hungry people.1 Every year over 6 million children under the age of five die worldwide, almost 3 million in India alone. Over half of these deaths are caused by inadequate nutrition. At least two billion people suffer from vitamin and mineral deficiencies. If all the world's undernourished people were gathered together, the population of that "hungry continent" would exceed that of every continent except Asia. The Dinka had been subsistence farmers in southern Sudan, one of the poorest places on earth. In the 1980s their already marginal existence was further eroded by a civil war that ravaged their homeland and forced them to flee their villages. Trekking two hundred miles into Ethiopia, they found shelter and survived for a time in a United Nations relief camp. But in May 1991 a violent coup in Ethiopia forced them to flee again, this time back into Sudan just ahead of their attackers. The Dinka's immediate plight was compounded by the chronic drought conditions that have plagued Africa for centuries. In this 1991 episode many of their numbers, especially the children, died of starvation, dehydration, and disease. the Dinka do not have the luxury of worrying about the environmental dangers of the twenty-first century, even though they are likely to suffer disproportionately from them: they have enough problems simply surviving from one day to the next. And the environment is no abstraction to them, as it is to so many people in the United States, Europe, and the rest of the wealthy, industrialized world. The Dinka experience the natural world directly, unmediated by electricity, running water, refrigeration, antibiotics, motor vehicles, and other modern technological marvels. Wildlife is the leopard that attacks their cattle or children, not something seen in books or at the zoo. And weather is no mere irritant to be neutralized with raincoats or central heating; it is an omnipotent unpredictable force whose whims determine whether there is enough food to eat. How does it happen that the extreme poverty of sub-Saharan Africa stubbornly persists in an ever more affluent world? 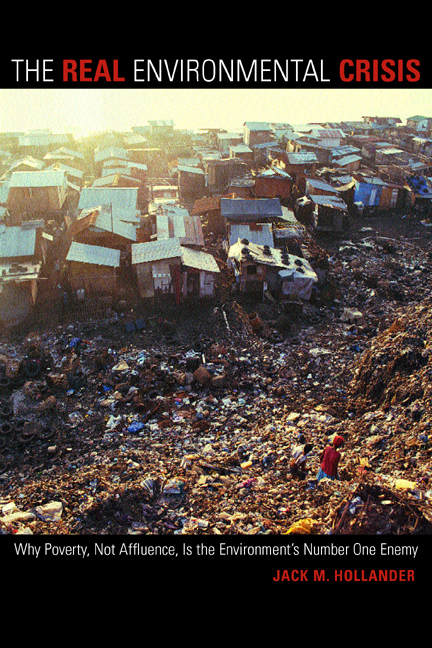 To what extent do environmental factors contribute to such poverty? And how does the poverty itself impact on the environment? Nature has dealt an unkind hand to sub-Saharan Africa. The heat is intense and debilitating. The soils are typically poor and difficult to farm sustainably. The rainy seasons can be extremely variable, with recurrent floods in some places (e.g., Mozambique) and persistent drought in others (e.g., Ethiopia). The climate encourages insect-borne diseases such as malaria and dengue fever. Although most organized groups elsewhere in the world were historically able to cope with environmental hardships (the early Scandinavians, for example, adapted well to their long and cold winters), in Africa the environmental difficulties have been so severe that survival rather than development has remained life's main goal for many groups. Yet nature's extremes, formidable as they are, do not alone explain the legacy of poverty and famine that still corrodes the environment of millions of Africans. Just as important are the centuries of slave trade and European colonialism (the latter ending only a generation ago), which sapped the land of its people and undermined its communities, institutions, and values and left an almost total vacuum of indigenous leadership and democratic tradition. While in recent times droughts and crop failures certainly have contributed to the region's chronic famines, civil strife is the source of many human disasters, the victims of which are mostly innocent civilians rather than combatants. The callous policies of many nondemocratic sub-Saharan regimes have also contributed to the environmental deterioration and social breakdowns, including unemployment and inequitable food distribution, that cause famines. All these factors have contributed to the region's enduring legacy of poverty. Under such conditions, it is hardly surprising that environmental concerns considered important to many in the affluent nations, such as global warming and ozone depletion, are far off the radar screens of people living in the world's poorest places. If you happen to belong to the Dinka tribe, you probably have concerns of a much more immediate sort—for example, fear that your children may not survive even the next few weeks because they have been deprived of food, shelter, or medicine owing to bad weather or a new round of political repression. Despite international environmental festivities such as Earth Day and the many United Nations conferences aimed at impressing third-world countries with the importance of the North's environmental concerns, a genuine interest in these high-profile issues has not arisen in the developing world. Most of these countries are still in the first phase of their development, struggling to overcome the immediate challenges of survival. Although their peoples must depend on use of trees, soils, and water for survival, they have few incentives for conserving these resources because they neither own them nor benefit from their conservation. Under such conditions, people are not likely to show an interest in the environmental issues of the affluent until they themselves begin to taste the fruits of affluence. In contrast to the prevailing situation in parts of sub-Saharan Africa, a number of developing countries elsewhere have passed beyond the survival barrier into the second phase of development—that of building a decent standard of living for their citizens through industrialization and modernization. On the Asian continent China and India are the largest and most visible of the "phase two" countries; Brazil is a good example in Latin America. A visitor to China will experience an environmental situation typically very different and less extreme than that of sub-Saharan Africa, yet one that is rife with environmental problems and equally revealing of the connection between poverty and the environment. The economy of China is developing with breathtaking speed, and the same can be said of China's environmental landscape. Only two decades after the end of the economically and socially disastrous "Great Leap Forward" program imposed by Mao Zedong, China's major cities, such as Beijing, Shanghai, and Chongqing, have undergone amazing transformations, joining the ranks of the world's largest and most advanced metropolises. High-rise apartments, commercial centers, and industrial complexes proliferate endlessly; urban parks and green belts abound; and the automobile and freeway have become a fixture of the new cities. Among the urban populace, the growing business and professional classes are stylish, urbane, and consumerist, indistinguishable in many ways from their counterparts in London, New York, or Milan. Regardless of which city captures the dubious distinction of being China's most polluted, the causes of pollution are similar in all of them—rapid industrialization, skyrocketing electricity use, and almost total dependence on coal for electricity generation. Beginning in the 1980s, the growth in China's electricity use has been among the world's fastest, doubling approximately each decade, which reflects Chinese citizens' increasing ability to afford the benefits of adequate lighting and modern electric appliances. It is no wonder that coal is the major fuel for electricity production, since coal is China's most abundant energy resource and coal production already exceeds that of the United States. Historically, coal has been the world's dirtiest fuel, and coal burning the world's leading source of air pollution. But this connection is no longer inevitable. Today, burning coal for electricity generation need not produce high levels of air pollution if state-of-the-art technologies are used for cleaning ("scrubbing") the exhaust stacks of the generating plants, a practice common (and legally required for new plants) in the United States and many other industrial countries. The problem is that China has rarely employed these advanced technologies, because they are so expensive to install and operate. For China at its present stage of development, achieving cleaner air (or other environmental benefits) has generally been of lower priority in allocating scarce financial resources than raising people's living standards by, for example, subsidizing traditional coal use to provide more and cheaper electricity. In China, high levels of environmental pollution are found not only in the cities but also in many rural areas. Unlike the case in Africa, a great deal of industrial activity takes place in rural China. Thousands upon thousands of factories, from garage-sized plants to large industrial complexes, employ millions of skilled and unskilled workers, including our bicycle factory welder. The pollution sometimes takes the form of river contamination so severe that the waters become sickeningly unfit for consumption, yet such water is often used for drinking with only minimal if any purification. Rural water pollution in China is probably even less tractable than urban air pollution. The rural population not only is generally poor and uneducated, with little understanding of the health risks to which people may be exposed, but also is geographically very scattered and lacks influence with the environmental authorities. Even more unfortunate is that the rural working poor tend to accept their polluted environment as a symbol of, and a small price to pay for, the benefits of those millions of factory jobs. There is growing evidence that this situation is changing, however, as both the Chinese economy and the Chinese people's environmental consciousness continue their fast-paced growth. Air-pollution control regulations are being enacted, and enforcement is being taken more seriously. In Beijing, clean-coal technologies are being installed and millions of tons of industrial coal are being replaced by natural gas. And now, galvanized by China's being awarded the 2008 Olympic games, the government is making earnest commitments to accelerate its clean-air programs. Given China's size and global importance, its environmental awareness, following on the heels of its increasing affluence, is a major reason for optimism about the world's environmental future. Whether in sub-Saharan Africa, China, or elsewhere, chronic poverty deprives huge numbers of people of the incentives and economic means to care for and nourish their natural environment. Yet being poor is only one element of people's blighted relationship to the environment. According to economist and Nobel laureate Amartya Sen, poverty needs to be understood in broader terms than only the lack of monetary income. Sen argues that poverty should be characterized fundamentally in terms of the deprivation of basic freedoms, rather than merely low incomes.8 In his view, development not only has the economic dimension with which it is usually understood but, more important, requires the removal of the "unfreedoms" endured by most people in underdeveloped countries. Besides poverty, these unfreedoms include deprivation of health care, lack of sanitation, exclusion from education (especially of women), exclusion from market activities, and above all, tyrannical regimes associated with systematic deprivation of political liberty and basic civil rights. Development, in Sen's view, must include the freedom of democratic choices as well as the freedom of economic choices. Without such freedoms, people lack the opportunity for education, public debate, and discussion, which make possible rational choices about quality-of-life issues, including the environment, as well as rational choices about their families or their government. It follows that environmental improvement requires not only a measure of economic power for individuals but also the broader freedoms of individuals to set priorities for themselves, their families, and their society. Such freedoms also nourish the development of social values and environmental ethics going beyond the bounds of government regulations and market rules. These values and ethics are essential for developing a healthy and sustainable environment. I have argued above that countries and people in the earliest stage of development tend to have little interest in environmental issues as typically understood in the industrial countries, such as acid rain or global warming. In the subsistence phase, sheer survival amidst historically hostile environments has usually been the main challenge of their lives. This is not to say that poor societies do not have respect for their own environment—Native American nations, for example, generally have a profoundly spiritual relationship with their natural environment (though it has often been abused by outside forces). I have also noted that countries and people in the second phase of development, such as China, are quite aware of the collateral environmental deterioration occurring along with their industrialization and modernization. Yet in countries such as China, not only is domestic investment capital scarce, but also social priorities, including environmental quality, are set mostly by government rather than popular choice. Investments aimed at cleaning the environment typically have not reached the top of the government's priority scale, because other social investments (e.g., in energy production, housing, education, and industrial production for consumption and exports) have been seen as providing far greater benefits. As mentioned above, this situation is changing as China's economy rapidly grows. A central thesis of this book is that the transition from the second phase to the third phase of a nation's development normally brings with it both a sea change in environmental consciousness and the political and economic means to care for and sustain a sound environment. In the Introduction, I traced briefly the environmental history of the United States and showed how this change took place as the country gained affluence following World War II. And it has just been mentioned that the same change is now happening in China—though decades will pass before the environmental improvements reach Western proportions. Of course I cannot assert categorically that people everywhere will automatically become protective of their environment as they become affluent, for that would stress my crystal ball beyond its capacity. Short of predicting the future, however, I cite the historical fact that a fundamental behavioral change toward environmental consciousness did take place in Western societies and Japan in the late twentieth century and is now beginning in China. I see no reason why we should not expect this to happen worldwide in the future. In any case there is no mystery about the traditional connection between affluence and the environment. People of means have always sought to live amidst beautiful surroundings, regardless of the squalor that may have been nearby. And for most of history, it was relatively easy for the rich to isolate themselves from the environments of the poor by using fences, rivers, and other trappings of physical separation. Those eighteenth-century country estates of England were indeed magnificent examples of environmental isolation. But with the coming of industrialization, the rich had no possibility to fence themselves off from the flow of polluted air. Blackened with the coal smoke from the factories of London and Birmingham, that foul air was destined to be inhaled by rich and poor alike. One may surmise that the current concept of the environment as a collective resource, shared by all and the responsibility of all, was born at least partly out of that experience. In this book I journey to those worlds apart—the environment of the poor and the environment of the rich. The journey allows us to look at the major environmental issues from both perspectives and provides evidence to support the argument that the most critical transition in the development of a sustainable future environment is the transition from poverty to affluence. This transition will obviously require at least several generations. Less obvious but no less important is the challenge to the global community to develop short-term environmental priorities that enhance the probability of long-term success as poverty is gradually reduced. 1. The data in this section are taken from United Nations Food and Agricultural Organization, The State of Food Insecurity in the World 1999 (Geneva: UNFAO, 1999). 2. Mark Hertsgaard, Earth Odyssey (New York: Broadway Books, 1998). 3. "Hopeless Africa," Economist, (May 13, 2000): 17. 4. World Health Organization (WHO), World Health Report, 2000 (Geneva: WHO, June 4, 2000). 6. Data from United Nations International Children's Emergency Fund, The State of the World's Children 1996 (New York: UNICEF, 1996). 7. See, for example, South Coast Air-Quality Management District, 1999 Current Air-Quality and Trends (Diamond Bar, CA, May 2000). 8. Amartya Sen, Development as Freedom (New York: Knopf, 1999). Drawing a completely new road map toward a sustainable future, Jack M. Hollander contends that our most critical environmental problem is global poverty. His balanced, authoritative, and lucid book challenges widely held beliefs that economic development and affluence pose a major threat to the world's environment and resources. Pointing to the great strides that have been made toward improving and protecting the environment in the affluent democracies, Hollander makes the case that the essential prerequisite for sustainability is a global transition from poverty to affluence, coupled with a transition to freedom and democracy. The Real Environmental Crisis takes a close look at the major environment and resource issues—population growth; climate change; agriculture and food supply; our fisheries, forests, and fossil fuels; water and air quality; and solar and nuclear power. In each case, Hollander finds compelling evidence that economic development and technological advances can relieve such problems as food shortages, deforestation, air pollution, and land degradation, and provide clean water, adequate energy supplies, and improved public health. The book also tackles issues such as global warming, genetically modified foods, automobile and transportation technologies, and the highly significant Endangered Species Act, which Hollander asserts never would have been legislated in a poor country whose citizens struggle just to survive. Hollander asks us to look beyond the media's doomsday rhetoric about the state of the environment, for much of it is simply not true, and to commit much more of our resources where they will do the most good—to lifting the world's population out of poverty. Jack M. Hollander is Professor Emeritus of Energy and Resources at the University of California, Berkeley. He is author and editor of more than one hundred research publications and twenty books, including The Energy-Environment Connection (1992). 3. Can the Earth Feed Everyone? 5. Is the Earth Warming? 8. Fossil Fuels–Culprit or Genie? 10. Nukes to the Rescue?